The Marc by Marc Jacobs girl is revolting again. Now at their third season at the helm of the Marc Jacobs diffusion line, Katie Hillier and Luella Bartley have explored a revolting bunny-hop ninja girl, and also rave culture in the U.K. in the 90’s. Once again the revolutionism is back. 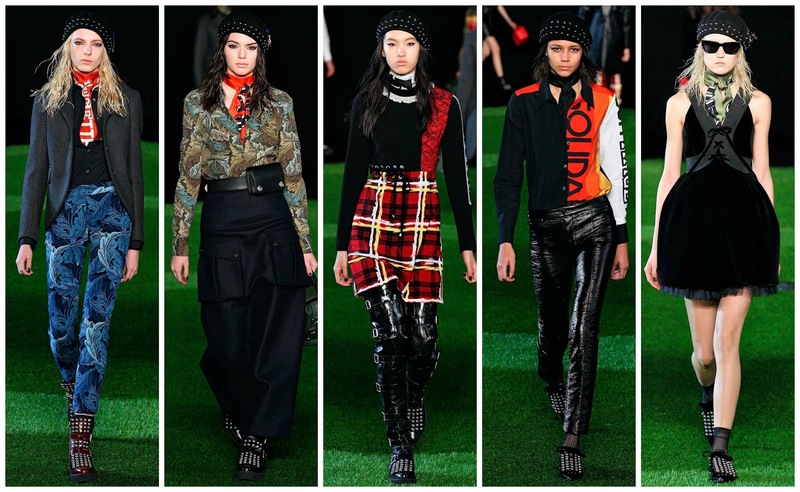 This season the models were members of the MBMJ army. The models marched on the runway wearing outfits emblazoned with ‘unite’, ’solidarity’ and ‘suffragette’. The warrior woman walked on a faux-grass perfectly mown lawn. The MBMJ aesthetic is shifting. Fall 2014 was the 18th century ninja girl, spring 2015 was a 90’s disco free spirit, and now Fall 2015 an entirely new entity. A militaristically driven young girl who is a suffragette, standing in solidarity with her peers. The final walk featured all the models lining up one behind the other in two rows before they paraded the runway. Artist William Morris’ prints were featured on the outfits. Look 8 resembled camouflage with it’s subdued hues but in fact it was florally printed. Funky tartans made their way down the runway, paying homage to the previous season in a reformed way. They were sweaters with mismatched coloured sleeves and featured the words ‘choice’ and ‘solidarity’ on them. High waisted trousers worn with a shimmering charcoal day coat and studded boots showed off the rocker chic vibe. This collection was unique and interesting, and totally wearable. When you see the looks together you may question this but if you inspect closely you can envision their simplicity and longevity as wearable wardrobe staples. One of my favourite looks was Look 30. A black halter party dress with a pronounced mini skirt. The dress featured a lace up bodice, satin details, a velvet body and a tulle-esque skirt peering out of the skirt. A beret á la the Guardian Angels, a silk scarf, too cool for school sunglasses, point toe studded flats and see through socks completed the look. I loved this empowered and strong MBMJ girl. She know what she wants and she’s willing to fight for it. She’s a suffragette. She stands in unity and solidarity among the people in the same situation as her. This is the kind of stuff that young girls should have instilled in them from a young age. VIVE LA REVOLUTION!